This past year was a busy year for us. We’ve made many improvements throughout the site and thanks to users like you we’ll be able to keep the site going into 2017. Thanks to users like you who are supporting us with monthly contributions, we increased our operating budget by about 33%! We’ll be putting that to use by keeping GovTrack Insider going and making small site improvements. Our goal is to raise enough to hire one full time staff member (we currently have no full time staff), but we’re still far away from that. We were in the news many times this year, including a hilarious mention in Last Week Tonight with John Oliver, a Washington Post endorsement of a congressional candidate, election fact-checking articles, and much more. Constitutional amendment proposals in this Congress, an article later linked to by the New York Times. Analyzing the congressional voting records of vice presidential candidates Tim Kaine and Mike Pence. Comparing how Ted Cruz, Marco Rubio, and Rand Paul voted in the Senate once their presidential bids ended, compared to before. Five gun control and mental health bills that could pass post-Orlando. Contrasting Hillary Clinton’s and Bernie Sanders’s Senate votes on Wall Street and the financial industry and on fossil fuels. We also covered fun bills, like this one that would significantly lower the price of your beer, this one that would lower the price of your concert and sports tickets, this one that would end taxpayer-funded portraits of politicians, and of course we can’t forget the Flamethrowers? Really? Act. After 15 years of asking Congress for better data about the status of legislation, Congress finally devised and implemented a new legislative data publication system earlier this year. You can read more about it at my blog post here. It is a big deal that Congress has moved to the 21st century in how they make legislative status data available to us and other data users. We began showing “key votes” on the pages for Members of Congress (like here for retiring senator Harry Reid). The key votes are selected automatically based on a statistical analysis. And we link to ProPublica’s missed vote explanations site whenever a Member of Congress has an explanation of why they missed a vote. Every bill page now has a link to if.then.fund, our sister site where you can make campaign contributions to Members of Congress that cosponsor bills you support — or to their opponents if you oppose the bill. We replaced our prognosis scores with scores computed by PredictGov.com. Their predictions about whether or not a bill will be enacted are more accurate than our previous predictions. We’re pulling in summaries of bills from Wikipedia when we don’t have a summary. 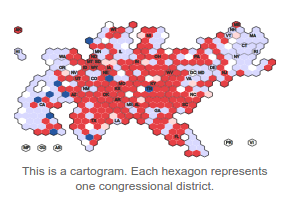 We completely re-did our congressional district maps, thanks to the help of volunteer Aaron Dennis and the support of mapping company Mapbox, to make our maps cheaper for us to maintain and update. Earlier this year we added links to Sunlight Foundation’s EmailCongress tool, but we removed the links after the Sunlight Foundation discontinued the tool. We improved the page load times throughout the site. We simplified the site’s design, which makes it easier for us to keep the site operating correctly, and we think it is more friendly in some places. I don’t recall receiving any of the recent posts by staff writer Jesse Rifkin – and I’m a monthly contributor. How are these posts sent out? Hi Jay. We post them in a few places – on the GovTrack.us homepage, on the GovTrack Insider page on Medium.com, and when the post is a summary of a bill the summary also goes on the bill’s summary page. You can get the posts in your GovTrack email updates. We also tweet them (follow @govtrack) and post them to our Facebook page.